ELIAS Silvano can only scratch his head in disbelief as his two fish ponds—one dedicated for raising tilapias and the other for bangus (milkfish)—are close to drying up due to the weak El Niño. The 72-year-old resident of Barangay Ocaña, Carcar City said he could harvest at least 150 kilos of tilapia and bangus from his ponds every three months before the dry spell. He was able to develop the ponds with the help of the Carcar City Government’s agriculture office, which enabled him to grow fish without using high-grade feeds, but through organic means. With the onset of the dry season, Silvano said he might collect wild bangus fingerlings and develop them for growth until the water in his ponds would rise to normal levels. Silvano said his ponds depend on the water from the Can-asujan River. Tilapia survives in freshwater, while bangus thrives better in brackish water. Silvano will just wait for the end of El Niño, saying he has no power to change the weather. The ongoing dry spell also affected four tilapia-raising associations in three mountain barangays in Carcar City. In a pond in Barangay Calidngan, around 15,000 tilapias were killed after the extreme heat made the water levels of Camari Lake drop to critical levels. Rey Trangia, acting Carcar City agriculturist, told SunStar Cebu that aside from the El Niño, which is causing undue stress to the tilapia, the increase in temperatures of the lake and sudden disappearance of their fishing grounds are also another factor to the fish kill. The freshwater tilapia farms in two other sitios in Calidngan had suspended their operations. 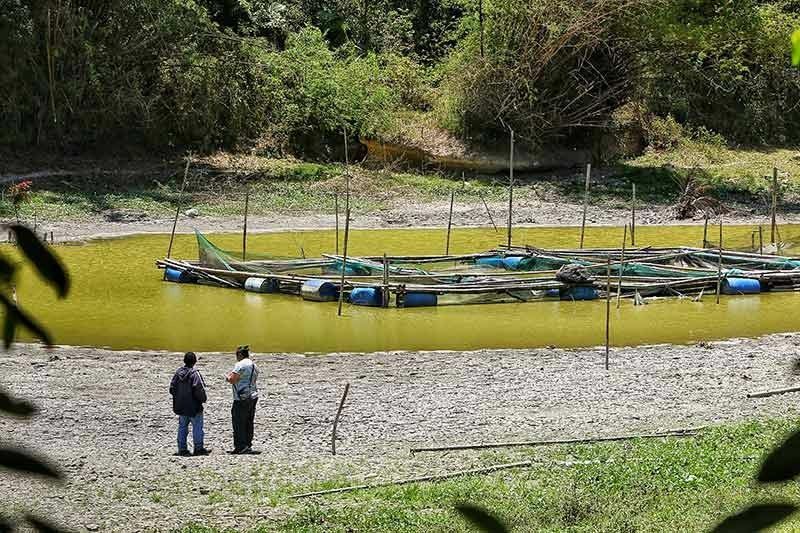 The farmers involved in the freshwater tilapia production in the villages of Guadalupe, Napo and Can-asujan have also stopped their fish cage restocking operations. Aside from tilapia, the bangus production in Barangay Tuyom was also affected. The farmers’ restocking of 4,000 bangus fingerlings suffered a fish kill earlier this month due to the extreme heat. Simeon Aledon, Carcar City fisheries coordinator, said the members of the Nagkahiusang Mananagat sa Tuyom (Namatu) were supposed to restock their bangus fishing cages in Sitio Bantayan when they encountered a fish kill after the delivery of the fingerlings from Barili. In Barangay Bolinawan, the edible seaweed production has dwindled. Members of the Bolinawan United Seaweed Farmers and Fishermen Association (BUSFFA) told SunStar Cebu that around five hectares of their seaweed plantations off the coast of their barangay are affected by the “ice-ice disease,” which happens when seaweeds turn white and hard due to the bacteria brought about by the changes in salinity, ocean temperature and light intensity. BUSFFA member Catalino Portolano, 60, said, at first, they were able to prevent the disease from spreading from seaweeds by cutting down the affected parts, but the ice-ice disease’s growth in seaweeds was too fast to control due to the increasing hot temperature.